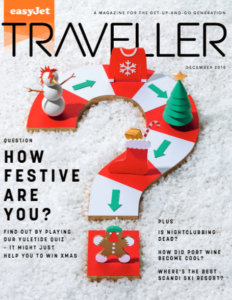 Escape to Mallorca or vacation in Marrakech? Why not both? 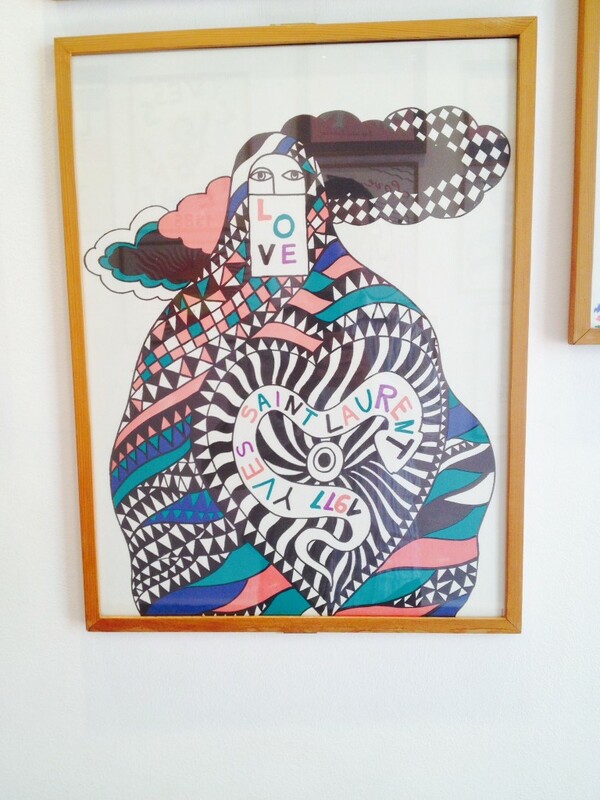 That’s exactly what interior designer Ariel Ashe of Ashe + Leandro did this summer. Here, she reports back to Tory Daily on the top five things to do at each sun-kissed destination. 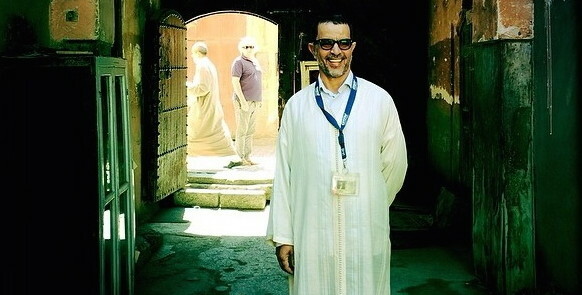 Tour the souk with Mustapha Chouquir — he is the best guide in Marrakech. Visit this hotel. We stayed in a villa outside of town, but if you want to stay in the city, El Fenn is magical. The rooftop bar has a beautiful view of the city and amazing textiles. Have a body scrub with Morocco’s black soap. A restaurant created by three sisters and run by all women, Al Fassia has really good food. Tip: Sit in the garden. Stay a night at this resort in the Atlas Mountains. It’s a real oasis and only an hour from Marrakech (or two hours if you take the scenic route through Berber villages.) And visit a Berber family for tea. Follow Ariel Ashe on Instagram. An obvious highlight of El Fenn is its rich, creative design aesthetic and contemporary art collection. 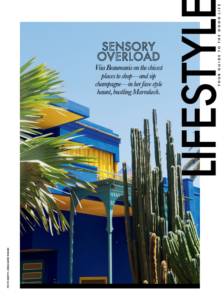 Every room, courtyard and space has a different colour scheme and feel, with riotous colour and stylish decor at every turn, as well as a combination of contemporary and retro elements. The renovation and interior design was carried out by general manager Willem Smit, with features including spacious courtyard seating in bright fuchsia, purple and sunshine yellow, while rooms feature marble baths, dual sinks, monsoon showers, open wood fireplaces, plunge pools and private terraces. 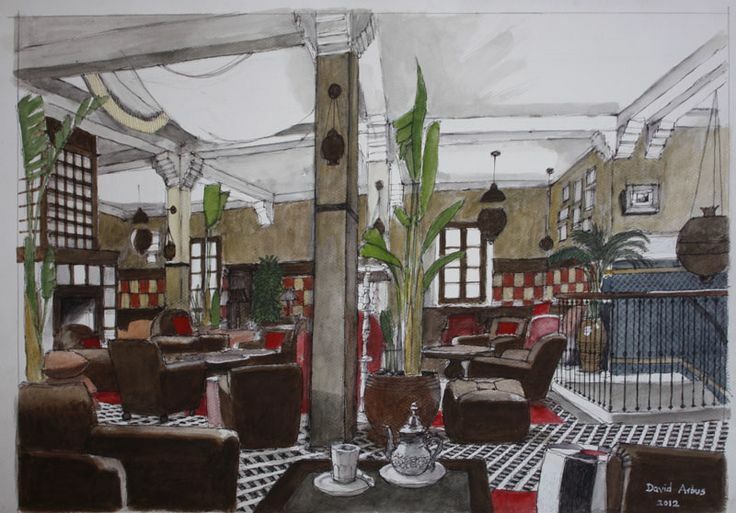 Meanwhile, Branson’s private collection of art work can be seen all around the hotel, with pieces including a chandelier by Francis Upritchard and a painting by Antony Gormley. Rooms are spacious, yet homely and comfortable, allowing for total relaxation. One of the stand out spaces within the hotel is its 7,000 sq ft roof terrace housing a bar, restaurant and beautiful plunge pool and sunbed area. Expect panoramic views stretching out across the Koutoubia mosque and the Atlas mountains, making it a breathtaking spot to watch the sunset – a real must in the evenings. The hotel restaurant, meanwhile, serves delicious fresh fish and meat options, based on a combination of Moroccan and European influences, but it’s the breakfast that’s the real winner. Enjoy freshly baked bread, pastries, fresh fruit, homemade granola and yoghurt, and eggs done any way you fancy, all washed down with freshly brewed coffee – perfectly setting you up for the day. If in search of local trinkets and design, look no further than El Fenn’s in-house concept store and boutique, co-curated by general manager Willem Smith and model Paul Rowland. The store stocks a range of carefully sourced items including vintage-style clothes in a range of print and patterns, plus bags, accessories, jewellery, coffee table books, perfumes and home accessories like Fez pottery. If haggling is more your scene though, simply head right out of the hotel and into the souks where you’ll find everything and anything you can imagine, in a true assault of the senses. 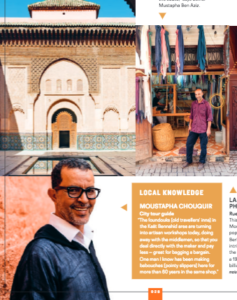 We’d highly recommend organising a tour with Mustapha Chouquir to get a sense of the local culture and history, as well as finding the best stalls for bargains. We were led to some great hidden spots for shopping leather sandals, rugs, berber baskets and lamps. 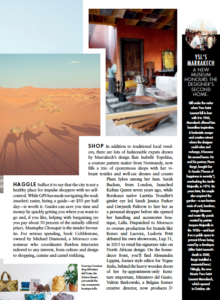 Stephanie Cavagnaro of the UK’s Nat Geo Traveller heralded Mustapha’s quippy tour this week! “This is the crazy place.” My guide, Mustapha, grins at the scene: hooded men in djellabas (robes) swoop between shaded alleys; Yamaha motorbikes hiss and pop through throbbing crowds; rust-coloured cats dart between zelije-tiled doorways. People pulse past gilded goods like blood through veins. The morph and muddle of colours and movement evokes a Jackson Pollock painting. “‘What a souk’ means ‘what a mess’… like my children’s room,” jokes Mustapha. When he smiles, he smiles big, showing a neat row of white teeth that match a short white and grey beard. 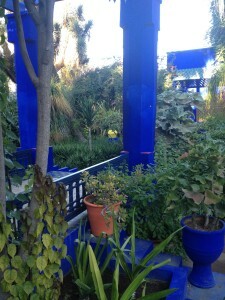 We met at Almaha Marrakech, my riad, before exploring Marrakech’s squeeze of souks. Despite a slight limp, he quickly weaves between donkeys (“local Mercedes,” he quips), carts piled high with watermelons and men running with bulging bundles of curled leather. He knows he’s impressed me, and quickly adds: “I’m also a friend of Maggie Gyllenhaal,” before producing his phone and showing me a series of images: one with Maggie and her family, another with a towering Alec, and a third showing a glowing Mustapha sandwiched between Mark Strong and Daniel Craig. He smiles big, starts to sing Another Brick in the Wall, and hurriedly limps off. I follow him to the quieter corners of this maze, where men are huddled over bags, darkening fragrant leather with oil and carving patterns into shiny silver trays. Others sip mint tea between bouts of embroidering vibrant ottoman poofs with long needles. “We don’t make Mercedes in Morocco, but we make beautiful decorations,” says Mustapha. I’m lost in the labyrinth, but Mustapha seems to know every inch of this place. We stop before a shrivelled old man crouched in the doorway of a cluttered workspace. He’s sifting through a pile of change when Mustapha speaks to him in Arabic. “We call him Omar International Bank,” Mustapha explains, pointing to the pile of copper and silver coins Omar uses to decorate belts and bags. Omar finds 10 pence, and shows it to me proudly. I nod approvingly, and we move on. Further along, a yellow-slippered foot bobs from between a doorway. It belongs to a man dressed in all white — skullcap, trousers and loose cotton shirt — who’s sitting cross-legged on a stool. 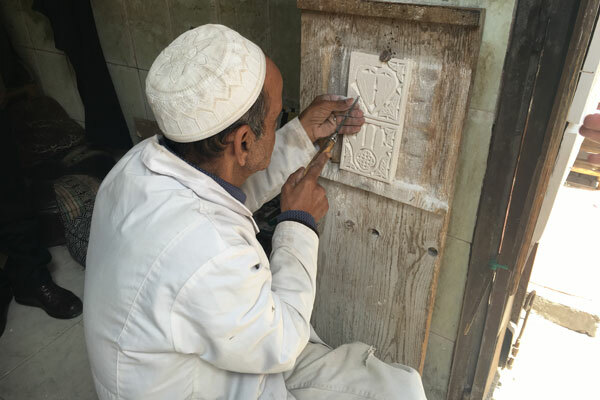 He’s absorbed in concentration, carving a Hamsa Hand motif into a tile, and doesn’t seem to notice us watching. Along these narrow streets, there’s a hum of artisans hammering, welding, carving and sculpting. Mustapha’s tour beyond the main streets of shops and shouting has me impressed. I only have enough dirham for a handmade ceramic bowl, but if I were Alec, I’d have bought a door too. 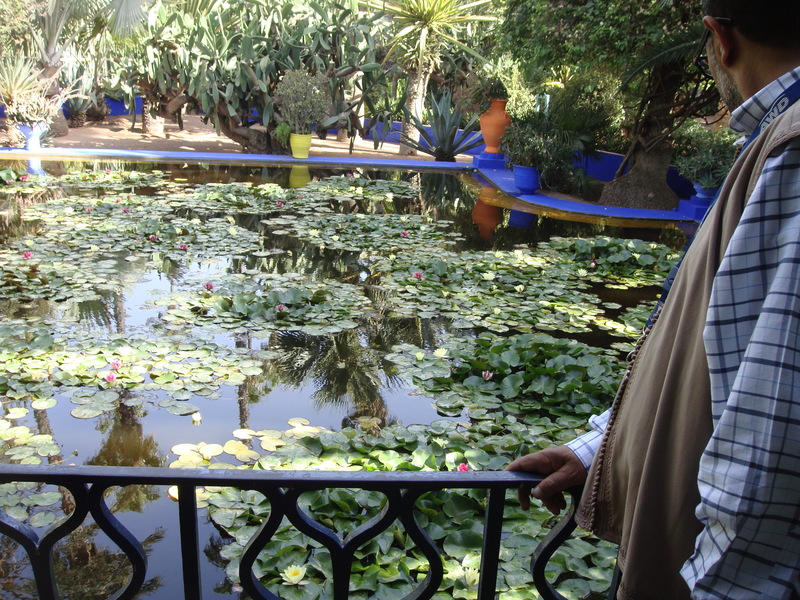 Mustapha often takes his clients to Jardin Marjorelle, a residence and botanical garden owned by French designer Yves Saint Laurent (who was actually born in Oran, Algeria) and his partner Pierre Bergé since 1980. 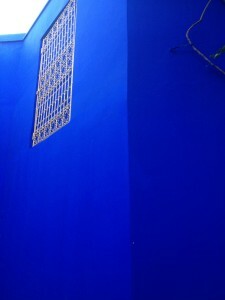 The buildings (which include a Berber museum) and various structures on the property are characterized by an electric – almost messianic – cerulean blue. 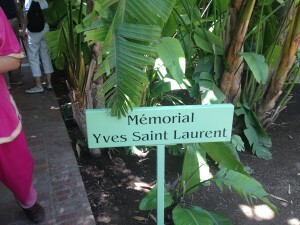 Yves died in 2008 and his ashes we scattered in the Jardin Marjorelle. 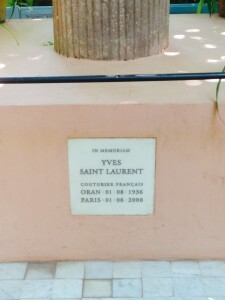 “Yves Saint Laurent a passé une grande partie de sa vie au Maroc. Il terminera là, dans un pays qui l’a beaucoup influencé, beaucoup marqué ; il finira dans le Maghreb dans lequel il est né”, avait souligné Pierre Bergé lundi devant la presse. 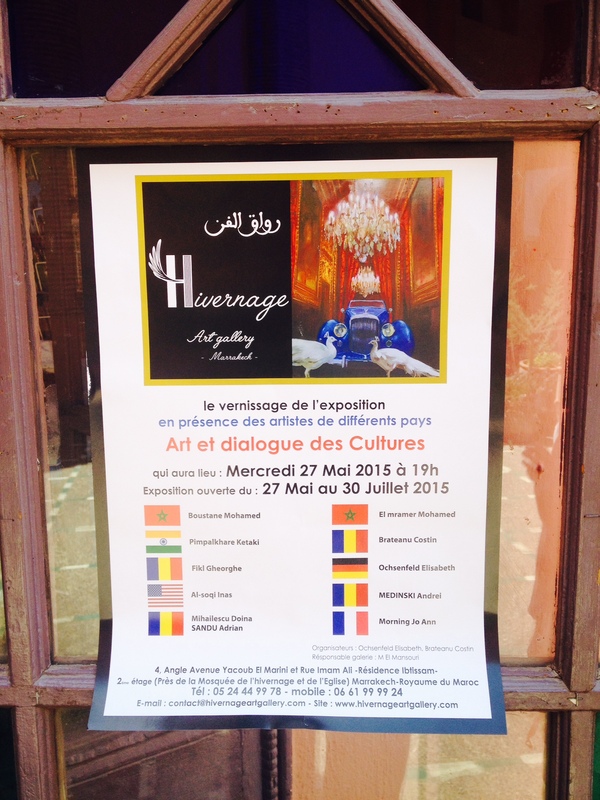 Hivernage Art Gallery in the trendy Hivernage neighborhood of the Nouvelle Ville has a new exhibition through 30-July featuring contemporary artists from Morocco and beyond. 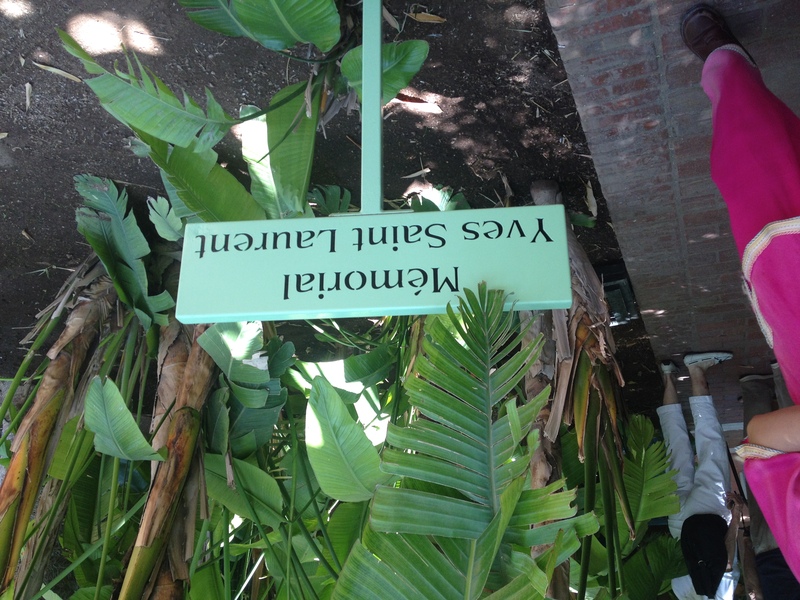 Mustapha suggests popping over on your way to Yves Saint Laurent’s Jardin Majorelle. 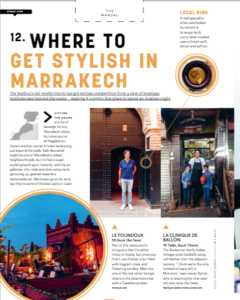 Trip Advisor’s #1 Destination: Marrakech! Trip Advisor just ordained Marrakech the #1 Traveler’s Choice destination in the world. The new Travelers’ Choice #1 Destination in the world, Marrakech is a magical place, brimming with markets, gardens, palaces, and mosques. Exploring the intimate courtyards and snaking alleyways of the historic Medina can easily eat up a day. 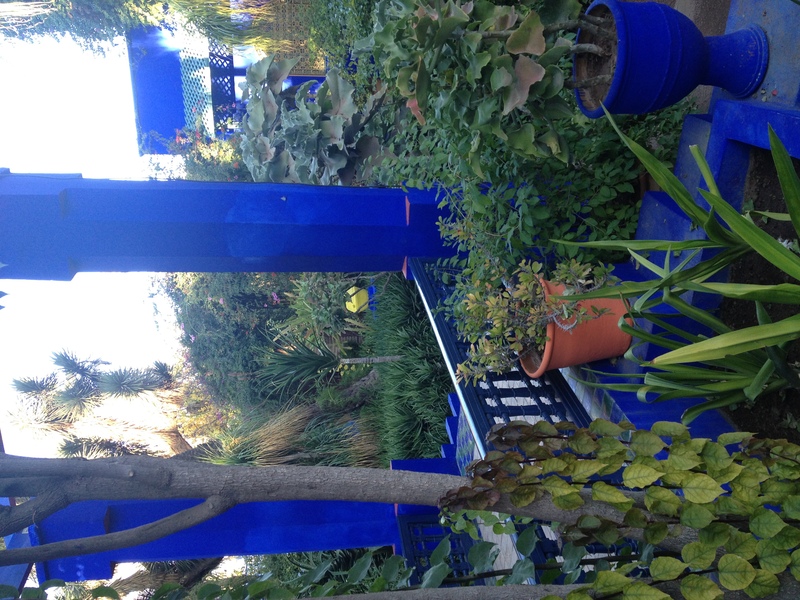 Find inner peace at the serene Jardin Majorelle or take in the beauty of one of the city’s historic mosques (taking note that you may only step inside if you are Muslim).